Green Gem lettuce is small to medium in size, averaging 13-20 centimeters in diameter, and is a compact, elongated head in a vase-like shape with densely packed leaves. The wavy leaves have serrated edges and are smooth, fleshy, and thick with a vibrant green coloring that transitions into a pale green-white on the thick midrib. The outer leaves are crisp with a melting quality and closer to the core, the leaves are ribbed, succulent, and crunchy. Green Gem lettuce is buttery and crisp with a subtly sweet flavor. Green Gem lettuce is available year-round. Green Gem lettuce, botanically classified as Lactuca sativa, is an annual variety that is a member of the Asteraceae or sunflower family. Also known as Sweet Gem lettuce and Winter Density, Green Gem lettuce was developed from a cross between romaine lettuce and a butterhead type lettuce. Green Gem lettuce is favored by chefs for its crunchy texture and ability to withstand heat in cooking. It is also a favorite lettuce of home gardeners as it can grow in small spaces and containers and can survive periods of warm summer weather where other varieties would bolt and wither. 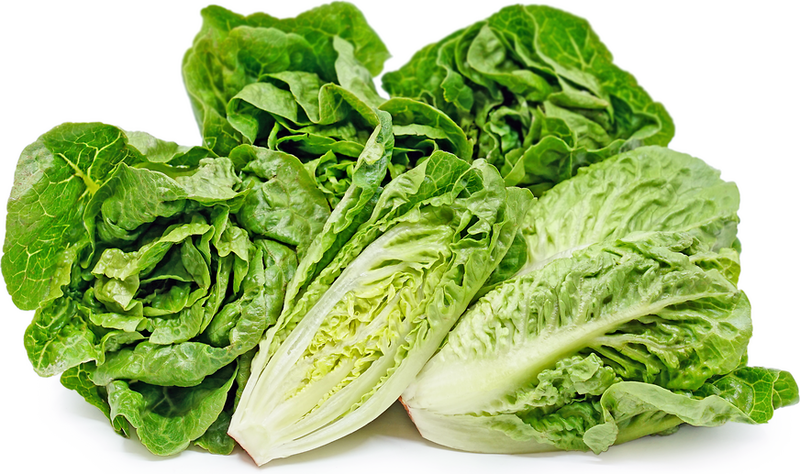 Green Gem lettuce contains vitamin A, vitamin C, calcium, and iron. Green Gem lettuce is best suited for both raw and cooked applications such as pan-frying or braising. When used fresh, the leaves can be torn and served as a salad, layered as a bed for meats and fish, or filled with a dip made up of fish, sauces, or chicken. The texture and subtle flavors of Green Gem lettuce are a perfect canvas for savory and bold companion ingredients and bright, fruity flavors. Green Gem lettuce also readily soaks up flavors, cuts fat, and holds sauces, vinaigrettes, and juices in the grooves of the leaves, similar to an edible sponge. When cooked, Green Gem lettuce can be sliced in half and lightly grilled and served with a citrus vinaigrette. Green Gem lettuce pairs well with citrus, tomatoes, radishes, asparagus, artichokes, chiles, fried or soft boiled eggs, fresh or aged goat and sheep's milk cheese, champagne vinegar, balsamic vinegar, cream-based dressings such as yogurt or buttermilk, dried fruits, apples, oranges, pears, melon, grapefruit, roasted chicken, bacon, shellfish, anchovies, smoked trout, herbs such as basil, cilantro, and dill and nuts such as pistachios, hazelnuts, walnuts, and pignolias. The leaves will keep for a little over one week when stored in the crisper drawer of the refrigerator. Also known as Sucrine, which means sugar in French, Green Gem lettuce is an extremely popular variety in Europe, favored for its silky but crunchy texture and sweet flavor. Commonly used in the United Kingdom, Green Gem lettuce is lightly braised or grilled and served as a garnish for salmon tartare and carpaccio, which is a raw appetizer that consists of thinly sliced meat such as steak or fish. The original Green Gem lettuce, also known as Buttercos Sucrine, is an heirloom lettuce originally cultivated in France. Today Green Gem lettuce can be found at farmers markets and specialty grocers and is primarily grown throughout Western Europe and along the coast of California in the United States. Recipes that include Sweet Artisan Green Gem Lettuce. One is easiest, three is harder.